There will be several pivotal fiscal policy battles this year and the fight over the debt limit may be the most crucial. This is a “must-pass” piece of legislation, so it will be a rare opportunity for fiscal conservatives in the House to impose some much-needed spending restraint. But it’s also a high-stakes game. If Obama (or Reid) refuse to accept the fiscal reforms approved by the House and there is a stalemate, the federal government ultimately would lose its ability to borrow from private credit markets. And while that notion has some appeal for many of us, it almost certainly would require more fiscal discipline than the political system is willing to accept (i.e., actual deep cuts rather than just restraining the growth of spending). In a bit of reckless demagoguery, the Treasury Secretary even says it would mean default – which could cause instability in financial markets. 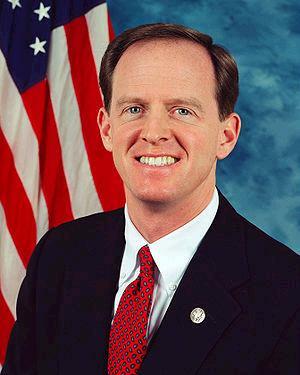 To preclude that possibility, Senator Toomey of Pennsylvania has a proposal to protect the “full faith and credit” of the United States by requiring the federal government to make interest payments a top priority. Writing for Bloomberg, I opine about the Senator’s proposal. …the federal government is expected to collect more than $2.1 trillion of tax revenue this year, while interest payments on the publicly held debt will only be about $200 billion. So even without an increase in the debt limit, the Treasury Department will have more than enough revenue to cover its interest obligations and avoid a default. That being said, financial markets are sometimes spooked by uncertainty. And since Treasury Secretary Timothy Geithner began making some irresponsible statements about the risks of default, there is growing interest in legislation by Senator Pat Toomey, a Republican of Pennsylvania, to alleviate the market’s fears. Quite simply, Toomey’s bill would require the federal government to fulfill obligations to bondholders before making any other disbursements. …If the Toomey legislation is adopted, fiscal reformers will have a powerful weapon at their disposal. Secure in the knowledge that default no longer is a possibility, they can be much tougher in their negotiations with the politicians who favor the status quo. This explains the attacks against the Toomey plan. Some even argue that the law requires the government to pay Chinese bondholders (gasp!) before it pays Social Security recipients. This is demagoguery. The federal government will collect more than enough revenue to finance the majority of budgeted outlays. Social Security checks will be disbursed, unless the Treasury secretary decides otherwise. In any event, the attack is rather hollow since it’s almost always made by people who say that default would be a cataclysmic event. What they really mean, it seems, is that deficits, debt and default are bad, and only higher taxes are the solution. That’s what this debate is all about. We have a fiscal crisis caused by too much spending, not too little taxes. Restraining the size and scope of government is contrary to the interests of the iron quadrangle of politicians, interest groups, lobbyists and bureaucrats who benefit from ever- expanding government. One of Milton Friedman’s great lines was his observation that people are more likely to be irresponsible when spending other people’s money. Jay Leno must be a closet libertarian, because here’s one of his jokes from the other night. First lady Michelle Obama told “Regis & Kelly” she was expecting jewelry on Valentine’s Day. She said it wouldn’t be anything extravagant because Barack tends to be responsible when he’s spending his own money.